Observations by a 33 year Local! As Accurate as my Memory Allows - Which is getting worse?? Look closely and you will see the water coming over the top of the flood gates! I would like to extend a special thanks to the Corp of Engineers, Stone and Taney County Sheriff’s Departments, Branson PD, Dispatchers, Taney County Fire, Branson Fire, Taney County Ambulance, The Emergency Management Team, Utility Company workers and a host of volunteer emergency workers who have done their very best to protect our properties and our safety throughout the “Civil Emergency”. Once again, The Ozarks has proven to be a place where neighbors reach out to help neighbors when times get tough! Please enjoy these pictures and remember our neighbors in your prayers! Branson is Alive and Well! The White River Lakes system has once again been challenged by Mother Nature in April of 2011. Branson has received 13 inches of rain in a 6 day period. Areas to the south and west received considerable more. We want to stress that the photos and events described in this site are quite some distance from most of the attractions and businesses in Branson. The theatres, theme parks, and other entertainment venues have been unaffected by the flooding and high water, and are open and running their regular, uninterrupted schedules. 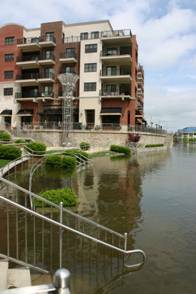 The stores of the Branson Landing are open and offer a rare view of the record water flow on Taneycomo. If in doubt about an activity, call ahead, but do not hesitate to come visit us. You might even get to witness and show your kids the rare and awesome site of water cascading over the spillways at Table Rock Dam! The White River Lakes system has somewhat tamed the wild White River Basin with the construction of four man made Lakes. Table Rock and Beaver Lakes are a part of this four lake system. The entire surface water runoff for a large area from Fayetteville, Ark to I-44 in Springfield, Mo passes thru Table Rock Lake, then continues to Bull Shoals and on to Memphis Tenn. For a complete description of this Lake System, refer to http://sueandersenrealty.com/flood2008/index.htm written after the 2008 flood. Leading up to the Flood! Forecasters had predicted a powerful storm was to hit the Ozarks beginning on Thru, April 21. A cold front from the West Coast was about to collide with warm moist air from the Gulf of Mexico and become stationary over the entire Table Rock watershed. On Thursday, April 21, the rains came as predicted and continued for the next 6 days. Interesting to note, there was virtually no wind for 6 days as the fronts collided and remained stationary for 6 days. Thursday’s light rain covered the entire Beaver Lake and Table Rock Lake water shed from Fayetteville, Ark to Springfield, MO. This had virtually no effect on the Lake Levels. 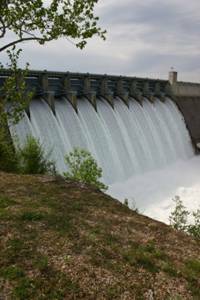 Table Rock Lake was releasing a total 14,000 CFS of water with its four generators running 24 hours a day. By Friday night, things begin to change. The stationary cold front was continually fueled by warm moist air from the Gulf. Branson received an additional 1.1 inches of rain. Unfortunately, this intermittent moderate / heavy rain covered the entire Table Rock watershed, from Springfield, Mo to Fayetteville, Ark. Once again, the lakes did their job. The effects on the lake system were minor. The entire water shed ground was now fully saturated. (Rock only holds so much water.) Any additional rain became surface runoff. Heavy rains continued Saturday thru Sunday morning. Branson had received 3.7 inches by Sunday morning. Many areas in the Table Rock watershed to the south and west received considerably more rain. 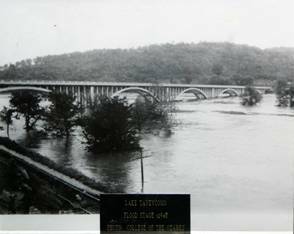 All tributaries to Beaver and Table Rock Lake were headed to Flood stages. These rivers would reach their temporary flood peak as a result of this rain by Sunday afternoon. Taneycomo Lake was full as a result of the heavy rain runoff on Saturday, splashing against the foundations of homes along Alexander Park. Intermittent moderate/heavy (no wind) rain continued Sunday and Sunday Night. This overnight rain was to cause all flooded tributaries from Springfield, MO to Fayetteville, Ark to raise to a new flood peak on by the following day (Monday). Table Rock Lake Rose 5 feet overnight. All major tributaries were above flood stages at a new storm high. To make matters worse, Beaver Lake was rapidly approaching flood stage and had to open the flood gates releasing water into Table Rock. This is only the third time in the history of Beaver Lake that the flood gates had been opened. Beaver Lake began its release at a rate of 10,000 cfs causing Table Rock’s level to raise at an alarming rate. Taneycomo was again full due to runoff. A few homes along Alexander Park now had water in them. Moderate to heavy rain continued. All tributaries were in flood stage and continuing to rise to a new storm high levels. Beaver Lake was releasing 10,000 cfs into Table Rock. Table Rock was continuing to rise at an alarming rate, 6.30 feet in 24 hours. The U. S. Army Corp of Engineers announced that the Table Rock Flood gates would begin opening at 2:00 pm Monday to 40,000 cfs. It was later announced that this would be increased to 52,000 cfs, an all time record rate of release. The Corp has advised that the flood gates will remain open until we are below 921 feet. Forecast calls for more rain for this coming Sunday Night, up to 2 inches. The Corp of Engineers is hoping to lower the water in Table Rock to at least 931 before Sunday to allow room for a 2” rain. When the flood gates are closed, their top is at 931 feet. In other words, water would overflow the gates at 931. When the gate are raised (4+ feet currently), water flows under the gates. Also, when the gates are raised, the top of the gate is raised (DUH!). But this allows the lake to be filled higher (4 foot higher). It raises the lake capacity by 4 foot. Consequently, even though the top of the normal closed gates is 931, with the gates open, additional water can be held – in this case, up to 935 – preventing even worse flooding. Over FULL!! Table Rock Lake has been lowered to 930.12. (Maximum Table Rock level with gates closed is 931) Area wide moderate rains are moving into the area with forecast of 1 to 3 inches. Corp of Engineers has just announced they will close all but 5 gates by 11:00 am. This will allow room in Lake Taneycomo for rain runoff and local flash flooding. The hopeful results is to prevent any worse flooding due to local flash floods from runoff. Table Rock is still at a critical level. Gates may have to be reopened after storms pass. The Corp of Engineers is doing an amazing job trying to prevent any worse flooding. Light to moderate rain began Sunday evening with Table Rock at 927, and continued thru Monday evening. This is part of the same storm system that devastated Joplin at approximately 6:00 p.m. on Sunday. By Monday evening, Branson had received 1.75 inches of rain, however, areas west toward Joplin and south received 5 - 8 inches in this storm. Beaver Lake was rapidly approaching flood stage Monday and had to open the flood gates into Table Rock. Table Rock opened its gates to 26,000 CFS initially. As rain continued into the evening, evacuation announcements were once again given to those in the low lying flood areas of Taneycomo Lake. It was then announced that the flood gates would be increased to 40,000 cfs. Many homes will be once again flooded. Due to the critically high level of the lakes and cautions by the Corp of Engineers, the lakes property owners had not started to rebuild. Most property owners had begun cleanup but were waiting for the lake levels to get back to normal before starting to rebuild. Table Rock Lake is expected to crest at 933.75 Wednessday (2.75 feet above flood). We have seen a lot of flooding and high water on Lake Taneycomo due to the all time record amount of rainfall in February and March. Keep in mind that this does not even come close to the water levels from the flood’s in pre 1957, before construction of the dam, when all of downtown Hollister was flooded (4 foot of water in the English Inn - 1945), consistent flooding to Branson up to the railroad tracks and the original Branson Taneycomo bridge was destroyed (1927). The documented pictures of pre-dam floods (before 1958) keep the legends of the wild White River flash floods alive. Taneycomo Arched bridge built in 1934 currently under renovation. New Bridge, completed in 2010 is just below it. 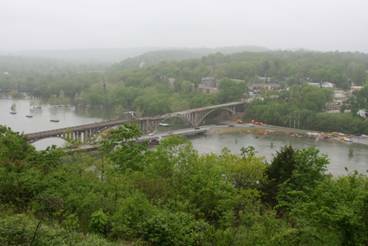 Taneycomo Arched bridge is 11 years old in this picture. Prior to construction of Table Rock Dam. The original Taneycomo Bridge was washed out in 1927! View More 1945 Historic Hollister Flood Pictures.